While some people might struggle with math, Donald Voorhies has turned it into his career. Voorhies, originally from New Iberia, graduated from Catholic High in 1963. He earned his bachelor’s degree in math from Loyola University before attending the University of Pennsylvania for higher education. Here, he received a master’s degree in math education research and his Ph.D. in educational psychology. From there, he returned to his home of New Iberia to teach mathematics at Catholic High School for 33 years. 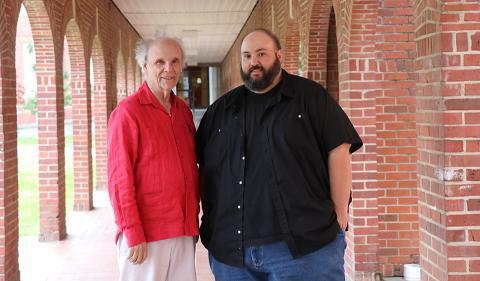 Voorhies now is helping the next generation of mathematicians achieve their dreams by offering a scholarship through the University of Louisiana at Lafayette. Initially, Voorhies thought that physics was the career path he wanted to take. However, once he began taking physics classes at Loyola University, he realized it wasn’t the major for him. Even though he knew what he didn’t want to study, he still wasn’t sure what he would change his major to. So, Voorhies went to the Registrar’s Office for help. “They looked at my transcript and I had the most hours in math, so I changed to be a math major,” said Voorhies. While at University of Pennsylvania, Voorhies discovered his true passion: teaching. As a student, Voorhies had a severe stutter. So, when the opportunity arose for him to substitute for a class at a local school, he didn’t think he was up to the challenge. After a little bit of convincing from his friends, Voorhies decided to give teaching a try. As soon as he walked into the classroom, Voorhies knew he had found his passion. “Within 30 seconds, I knew that was what God made me to do,” said Voorhies. From that moment on, he never stuttered again. Voorhies began his relationship with UL Lafayette initially by taking classes simply for his enjoyment. He started taking theatre classes and later transitioned into taking math classes. While taking math courses, Voorhies got to know several of the professors and students really well. He realized there was a need for funding in this area and that’s how the Dr. Ross A. Chiquet Endowed Scholarship in Mathematics was born. Voorhies hopes that his scholarship will help future mathematicians and math teachers fulfill their dreams. “I just want it to help someone who wants to pursue it,” said Voorhies. Even though he never graduated from UL Lafayette, Voorhies knows the impact that the University has on the community. Specifically, he loves that the University serves as a catalyst to allow people to become successful. “This University produces elite students,” said Voorhies. And thanks to Voorhies' generous scholarship, he knows that he’ll continue to help the University thrive, one student at a time.